Has all the looks of a Philips lamp. Also have a 160w with this same shape, just smaller. Great lamp, Dave! 1981 seems a bit late for such a rounded bulb model though. 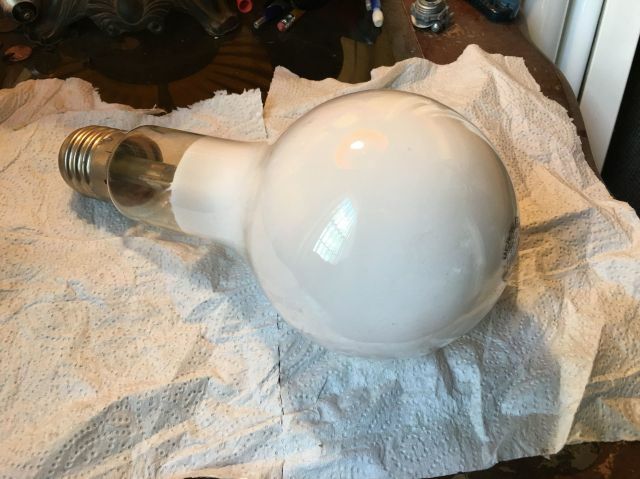 At that time the Companie des Lampes (and all other manufacturers established in France) had already phased out the PS bulb in their mercury lamp portfolio. So, your lamp would in fact better fit 1961, and could also have been made by Claude, in Reims. Can't be 1961. This got the Yttrium Vanadate phosphor, and a bit of a cheap coating process. I have an MLL-250 that looks EXACTLY like this!